Delidding is a process with the aim being to reduce CPU core temperatures on processors with a less-than-ideal thermal interface between the silicon and headspreader. The benefits of delidding a design with such an interface lead to having a cooler system, or the ability perform extra overclocking with a larger delta for thermal headroom. However, delidding a processor does carry risk, such as potentially damaging the CPU when done incorrectly and certainly voiding the warranty. In this article, we have produced a How-To guide for delidding one of the latest desktop processors: AMD's Ryzen 5 2400G APU. Most modern processors are manufactured with the integrated heat spreader (IHS) on top of the package, and attached to the package with a layer of glue. Between the CPU and the headspreader is a thermal interface material (TIM). The TIM is designed to transfer the heat away from the processor into the headspreader and eventually into a CPU cooler. The quality of the TIM used on modern processors can vary greatly, from a layer of cheap thermal paste to direct indium-tin soldering between the silicon die and the IHS. When a manufacturer decides how to package their processors, the type of TIM used is an important part of that decision. Not only does it have to be sufficient to be suitable to last 10+ years, it also has to make sure that the processor works within specifications for that time, after plenty of heat cycles. The method also has to scale - some processor families are manufactured on the scale of tens of millions, so the process has to be quick. It also has to cost appropriately per unit. Saving a single cent per unit over ten million units is a $100k saving. A lot of discussion on the internet on this topic revolves around why the cheaper implementations do not spend $0.10 more for a better solution, especially on a $1999 product (or why a flagship product has a cheap implementation). Ultimately a fine balance has to be made - a standard TIM 'goop/paste' has sufficient longevity but lower performance, while a direct soldering has the best performance but might not withstand mulitple years of cycling. By delidding a processor, a user can replace the TIM between the die and IHS. Normally this is done to remove a cheap goopy paste solution and place a better interface, ultimately upgrading to the higher performance variant, or what some might argue should be the standard. Delidding a processor therefore works best on solutions that have the cheapest TIM implementation. 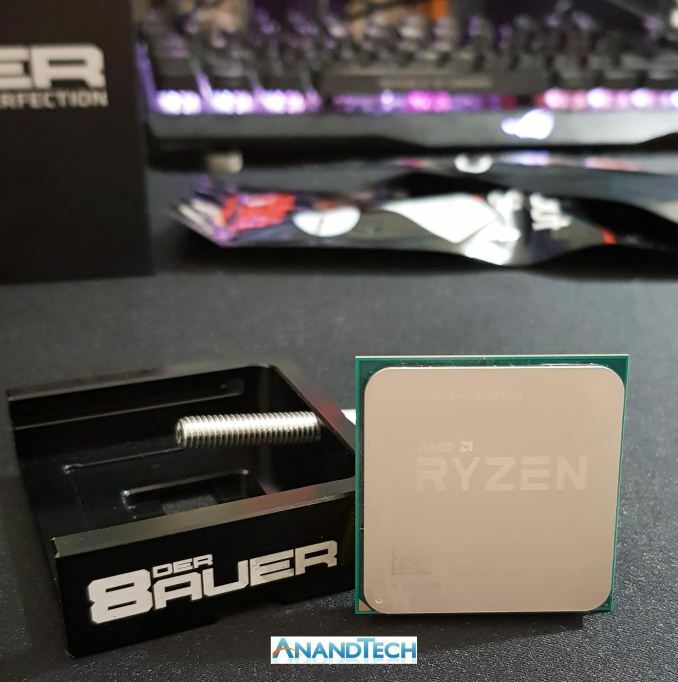 For our guide here, we have chosen to delid one of our Ryzen 2000 series APUs. 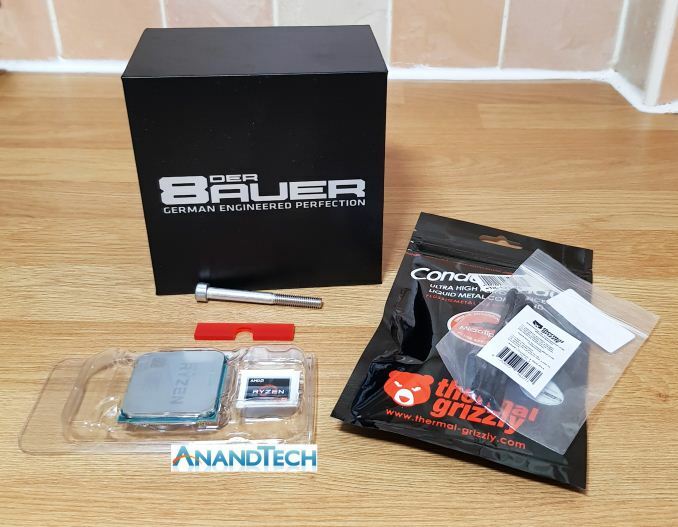 While the AMD Ryzen 2000 series APUs have proven to be budget friendly light gaming workhorses, the extreme overclocker and engineer Roman ‘Der8auer’ Hartung has created and marketed a specific add-on kit/delidding tool for use in delidding the Ryzen 2000 series APUs. This is called the Delid Mate 2, which we will use today. The conceptual idea of delidding has primarily been attributed for non-soldered CPUs, which has historically been the way that Intel has built its processors. Almost all modern mainstream Intel CPUs. such as the Intel Core i7-4770K, i7-6700K and even the newest i7-8700K use a thick goopy paste to create contact between the CPU and the IHS. For AMD's line up, the APU processors use a similar method - so the new Ryzen 2000 series APUs and the Bristol Ridge APUs. 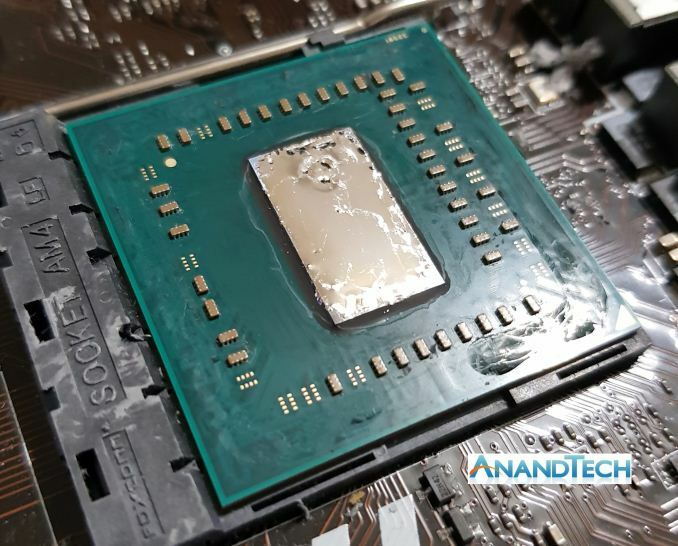 It should be noted that all of AMDs performanced based desktop chips such as Ryzen and Threadripper all use indium-tin solder, and do not need to be delidded. Similarly, Intel's HEDT processors are often not delidded. The idea is that replacing the cheap inefficient pre-applied paste with a thinner layer of better quality paste or liquid metal with a higher performance (measured in W/mK, Watts per Kelvin-meter) not only improves thermal conductivity and thermal heat transfer from the die, to IHS, to cooling plate, but could also allow for a quieter system as the fans do not have to work as hard. 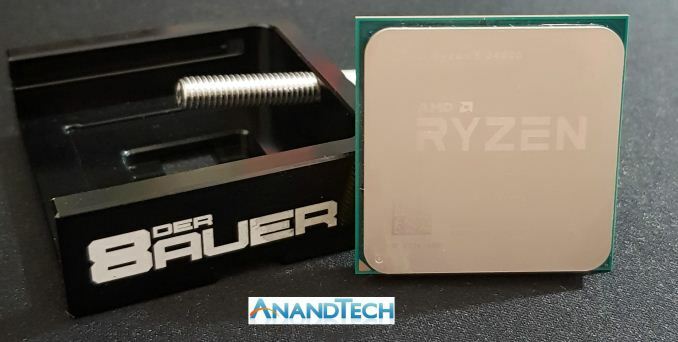 The Ryzen 2000 series of APUs are great products for the price, and there are a couple of notable reasons why delidding one could be beneficial. The biggest application where thermals are more important are in tight spaces such as in small form factor PCs or in home theatre PCs that specialise in small form factors and quiet systems. In HTPCs, delidding would reduce the pressure on the small coolers in play, as welll as reducing noise from any fans. Another application in delidding would be to extract every last drop of available headroom from it, whether that’s running a capable Ryzen APU past its non-delidding capabilities to increase frame rates within games, or even to shave off time in rendering video projects; the benefits are applicable to most scenarios with higher clock speeds. In our results, shown on the last page, we saw a 12ºC reduction in temperatures when the system was fully loaded at stock frequencies, and an 11ºC reduction when overclocked to 4.1 GHz. Due to the nature of the manufacturing process, we managed another +100 MHz on the overclock as well. First of all, the biggest risk in delidding a processor is damaging the processor during the process. The last thing that any user would want would be to destroy their brand-new chip with a dodgy slip of the wrist. Older methods of delidding processors involved using a hammer and a vice, potentially causing the CPU to fly off and hit the wall when too much power was applied (yes, I have done this personally). The other equally big risk in delidding a processor is it instantly voids the warranty, which removes any attached rights as a consumer to returning if it goes wrong, or if it somehow dies in the process. This alone presents the biggest consequence from delidding and it shouldn’t be done on any component which cannot be afford to be replaced; RMA fraud is not condoned and will not get a further mention other than this one. What Tools Do I need To Safely Delid My Ryzen 2000 Series APU? There have been many methods that used to delid and remove the IHS from the package. The market is such that there are now specially manufactured tools for the process, such as the Der8auer Delid Die Mate 2, or 3D printed tools, including one created by a user by the name of Chri. Other methods and conspicuously risky ones at that include the hammer and vice method and cutting which involves separating the glue from the heat spreader. The risks involved with this mean one tiny miscalculation with pressure and cutting depth can ‘nick’ the die which would render the silicon potentially useless and dead. My method to delid the Ryzen 5 2400G ($169) is to use the Der8auer Delid Die Mate 2 which retails for around $48 at Amazon. While other methods do seem somewhat attractive and ultimately cheaper, the cost of dead silicon outweighs the cost of the tools associated. 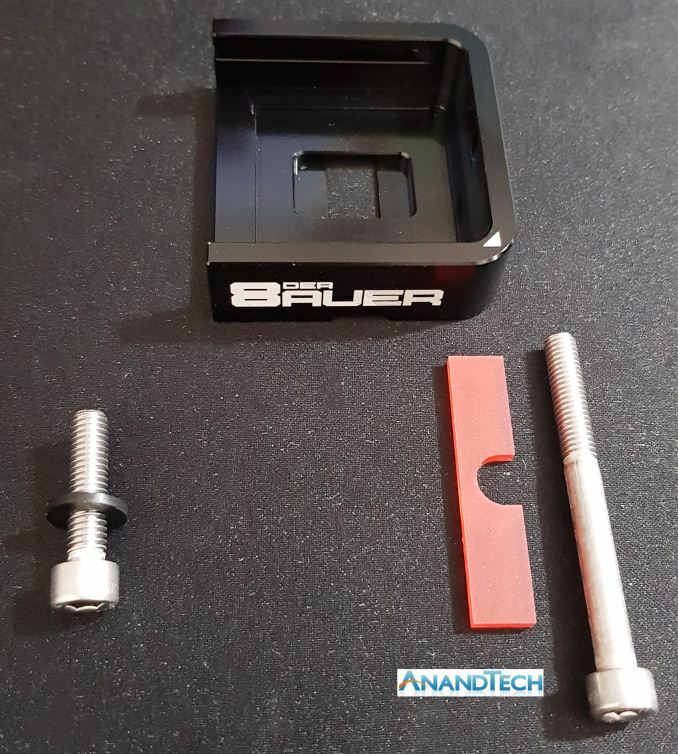 I have used the Der8auer range of tools for years including the first Delid Die Mate and the Delid Die Mate X for X299 chips. While the above tool was specifically manufactured with the aim of delidding Intel based Kaby Lake, Coffee Lake and even the older Sky Lake processors, an additional AMD kit is available. The kit consists of a longer M6 x 60 mm hexagon threaded bolt and an acrylic adapter to ensure the bolt doesn’t touch the pins. By virtue of AMD using a pin-grid array socket on its processors (i.e. pins on the bottom), it makes the process all that more risky. How about the iGPU results? I was actually only looking for those to be honest. Aside from temps delidding makes nothing else for the APU, you can get the same max igpu clock on any random 2400G.